engagers, by comparison, is an renegade agency run from a small, rural island in Lake Ontario – not that we’ve noticed. 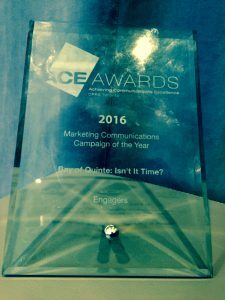 We play on the same field as the titans of the communications and marketing industry, as evidenced by the other 2016 ACE Award winners. We’re immensely proud of our work with the ‘Bay of Quinte: Isn’t it Time’ campaign, and when we created the strategy we realized we needed to target the GTA: the west has been developed, the north is expensive, but the east sits in the imagination as possibility, with unique and varied rural and culinary experiences. The truth behind the strategy became so clear to us that less than three years after founding engagers, Bruce Sudds moved the business and his family to Amherst Island, convinced by his own marketing for the Bay of Quinte region that this was THE place to be. Here at engagers we feel we’re a part of a growing insurgency of small agencies that can respond deftly to the needs of large organizations across a variety of industries – our past clients include HotDocs, Canada Blooms, and the Bay of Quinte region, among others. We approach all our projects with passion and commitment – something that gives us a competitive edge. The quality of our creative work and results-driven campaigns allows us to compete with massive marketing and communications organizations. engagers bucks the traditional agency model of pre-packaged, formulaic solutions – instead, we work in close partnership with our clients to ensure incredible success. Our work with the Bay of Quinte Tourism and Living Councils is an (award winning!) example of that. No other destination marketing organization or regional tourism organization was represented at the ACE Awards Gala. The results we’ve achieved with Bay of Quinte are unprecedented: last summer hotels in the region doubled the number of rooms booked over summer 2014. The successful partnership with with Bay of Quinte had an incredible impact for the region. In October 2015, nine months after launching the campaign, home sales in the region increased 28% over sales in October of 2014. Less than two years after launching the campaign, the area’s developers are reporting an 80-100% increase in lots serviced. These kinds of numbers are unprecedented for this region, which had one of the slowest rates of economic growth in Ontario. Hoteliers are also reporting unprecedented growth in hotel rooms bookings. To see how engagers can help your organization, drop us a line at info@engagers.ca.